No One is Illegal in Vancouver are fighting against the deportation of an Iranian refugee, well known in the local community for his dancing. "Refugee claimant Iraj Ghahremani, 70, has danced as a "Santa Claus" in North Vancouver's Iranian new year festivals since he fled Iran in 1999. 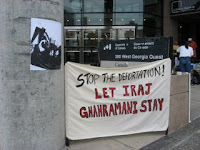 But now that Canada has denied him refugee status and ordered Mr. Ghahremani deported next week, the Iranian community fears it will lose a dancer much-loved by children, and that Mr. Ghahremani will be imprisoned in a country where it is forbidden to dance in public. "I want to bring happiness to the Persian community," Mr. Ghahremani said. "Right now dancing in Iran is forbidden, it's suppressed, they don't like that kind of happiness." Ray Negini, a friend, added: "He helped people and has made the children laugh. He is a humorous person who will not be abandoned. No one can replace him." Mr. Ghahremani plays Haji Firouz, a boisterous traditional figure whose songs and dances herald the coming of Norouz, the Iranian new year. 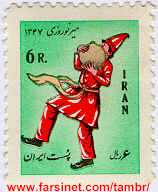 Clad entirely in red with a pointy hat, Iranians liken him to Santa Claus - a well-known figure in traditional celebrations who has little meaning in religion. This was his favourite character when Iran was under the regime of the shah, which crumbled under the Islamic revolution in 1979. Among the reforms demanded by Ayatollah Ruhollah Khomaini in the new Islamic Republic was a strict prohibition against dancing in public.